696 COLOURlovers viewed this page and think CoolBlue71 deserves two thumbs up. 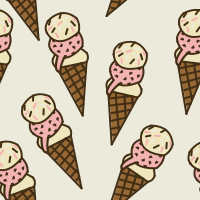 "Ice Cream Parlor" is more suggestive of a wallpaper pattern suitable to such an environment. Credit must be given to CoolBlue71 & amyanneerickson.